Pinned Steps: A Suitable Way Up Bedrock Trails? 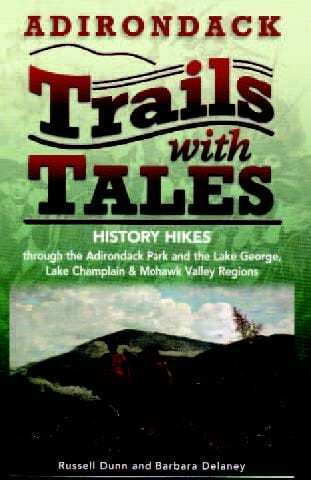 The Adirondack Explorer‘s November/December issue is in the mail, but Mike Lynch’s story on deteriorating trails in the High Peaks is already gaining attention on the Adirondack Almanack, the Explorer‘s online journal. 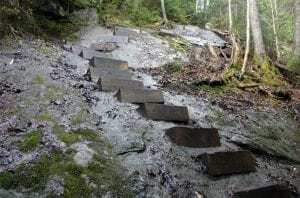 The article, headlined “Trails showing their age,” notes that a combination of poor design and heavy use has led to severe erosion on trails. Older trails tend to go straight up a slope. In some cases, erosion can be mitigated by rerouting the trails to create switchbacks. Unfortunately, at higher elevations, where the soil is thin, cutting into the slope to create switchbacks may not be possible. Goodwin refers readers to photos of the Beaver Brook Trail on Mount Moosilauke in New Hampshire to see what these pinned steps look like. 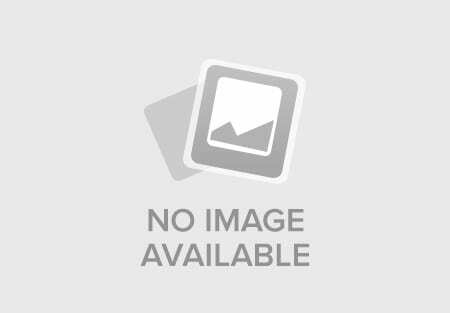 One of these photos is shown below. What do you think of this idea? If you have an opinion, we encourage you to read Mike Lynch’s story on the Almanack and join the conversation. You’ll also find in the November/December issue of the Explorer three stories relating to the Boreas Ponds Tract: an explanation of the Adirondack Park Agency’s four options for classifying the tract, a description of hiking opportunities near Boreas Ponds, and an account of rock climbing on Ragged Mountain, which is on the tract. Brian Mann provides an update on the controversial Adirondack Club and Resort development in Tupper Lake. Although the project was approved several years ago, the developers have yet to begin construction and have yet to obtain key permits. Mike Lynch writes about a rash of bear encounters in the Adirondacks. The dry summer and a shortage of berries may be partly to blame. Bill McKibben turned in a story on Steve Ovitt, a retired forest ranger who is building trails in the North Creek area with the aim of connecting the community to the wilderness that surrounds it. We provide an explanation of Protect the Adirondacks’ lawsuit against the state over the construction of wide, graded snowmobile trails in Forest Preserve. It could create an important legal precedent. Guidebook author Lisa Densmore Ballard writes about the wonderful views from Snowy Mountain west of Indian Lake (the lake). Alan Wechsler, a winter Forty-Sixer, gives advice on ski approaches to the High Peaks. Historian Philip Terrie reviews Half-Earth: Our Planet’s Fight for Life, in which the renowned scientist E.O. 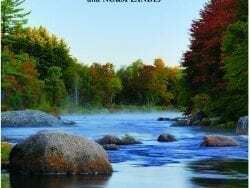 Wilson warns that we humans need to protect wild lands to prevent a mass extinction of species. These are just some of goodies in our latest issue. If these pique your interest, please consider subscribing. 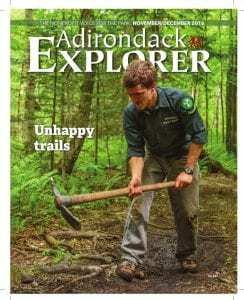 Top photo: Cover of latest Adirondack Explorer. Lower photo: pinned steps on New Hampshire’s Mount Moosilauke.